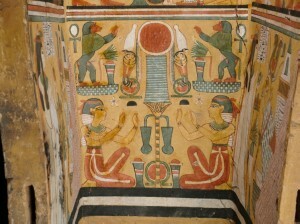 Isis and Nephtys with their hair covered by a white cloth and with a red band. Scene from the tomb of Siptah. XIX Dynasty. Photo: The Theban Mapping Project. The inner part of the coffin offered also the artists of Ancient Egypt a great surface for the sacred iconography. So, what was outside could also be drawn inside. At that point is emblematic the outer coffin of Nesykhonsu (XXI-XXII Dynasty), in whose interior were represented some typical resurrection scenes of the ancient Egyptian art. In the middle the mummy of Nesykhonsu is being assisted by a priest, while at his feet a squatting common mourner cries. They are adoring a typical solar icon of Ancient Egypt and we already know about the union of Isis and Nephthys in the solar iconography. They are at the feet end of the piece. The two mourners were usually depicted in the outer surface of the lid, in the case of Nesykhonsu the ancient Egyptian artist decided to locate them in the inner part, but still at the feet of the container, as if they were two pillars supporting the body.